Ground squirrels are small, burrowing rodents found throughout the state. There are two different species in Indiana. These are the thirteen-lined ground squirrel (Spermophilus tridecemlineatus), found throughout the state, and the Franklin’s ground squirrel (Spermophilus franklinii), which is endangered in Indiana and whose distribution is limited to populations in the northwest corner of Indiana. Thirteen-lined ground squirrels prefer grassy areas such as pastures, golf courses, cemeteries and parks, while Franklin’s ground squirrels prefer higher dense vegetation along embankments where they are likely to find good cover and abundant sites for burrowing. 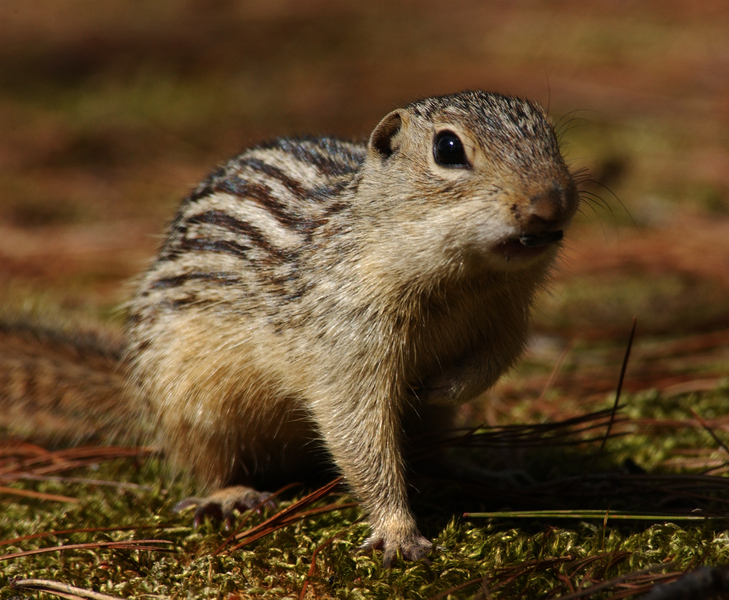 The thirteen-lined ground squirrel most commonly causes damage by burrowing and gnawing. Thirteen-lined ground squirrels live in burrows that are usually 2 to 3 inches in diameter and 15 to 20 feet long. The burrow system usually has two entrances. Dirt piles around the entry holes are common with thirteen-lined ground squirrels but not usually with Franklin’s. Entry holes for Franklin’s ground squirrels tend to be larger than three inches. Sightings of Franklin’s ground squirrels are so infrequent that their damage impact is considered negligible. Ground squirrels may hibernate during the coldest periods of winter. Ground squirrels normally do not cause extensive damage in urban areas. However, they will feed on flowers and vegetables in gardens, and their burrows can be a nuisance. In rural areas, ground squirrels can do extensive damage to cropland or pastures. They may dig up newly planted seeds, eat sprouting plants and weaken earthen dikes with their burrows. Their burrowing and gnawing behavior also can cause damage in irrigated areas. Light to dark brown with 13 stripes the length of the body. 2 1/2 to 5 1/2 inches. Two to 13. Average four to seven. Grizzled brownish gray above, sometimes appears spotted; yellowish white below. Juveniles are darker than adults. 4 ½ to 5 inches. 1 per year, born in May or June . Ground squirrels can be controlled by a number of different methods. Where ground squirrel populations are high, several control methods may need to be used at the same time. Regular control may be required to prevent re-infestation from surrounding populations. Rodenticides provide the most economical method for controlling large populations of ground squirrels. Restricted-use pesticides are available but can only be used by a licensed pest control operator or a person who has a private applicator’s license that permits the use of such chemicals. Directions on all toxicant labels should be read, understood and followed exactly. Because ground squirrels are not normally active during the cold winter months, these chemicals are ineffective at this time of year. Fumigation of burrows is an effective technique. The gas cartridge is a common fumigant that is available from the USDA Pocatello Supply Depot, various feed stores and garden supply centers. Directions on all toxicant labels should be read, understood and followed exactly. When using any fumigant, it is important that the soil contain adequate moisture. Moist soil holds the fumigant in the burrow and prevents it from seeping through the soil. Do not use these fumigants under buildings. These fumigants are ignited and then smolder (burning up the oxygen) which may create a fire hazard to dwellings and result in a hazard for the occupants. Habitat manipulation will sometimes discourage ground squirrel activity. Thirteen-lined ground squirrels prefer areas with short grass. Therefore, control can be achieved by allowing the grass to grow into dense stands, which changes the habitat, or by cultivating infested areas, which destroys the burrows. Ground squirrels can be excluded from gardens or flower beds with fences made of either sheet metal or 1/2-inch hardware cloth. The fence should be at least 18 inches high, with about 6 inches buried in the soil. The fence should completely surround the area to be protected. This costly method usually is practical only in small areas. To prevent burrowing beneath an existing fence or deck, attach a 3-foot wide heavy gauge wire mesh screen to the bottom of the fence so it extends >24 inches outward. Secure the screen to the ground with garden staples and backfill over the mesh with rock mulch. Traps are often effective where there is a small population of ground squirrels or in urban areas where a toxicant cannot be used safely. Small cage traps are available from feed stores, sporting goods stores and many garden supply centers. Traps should be baited with peanut butter, grain or oats and placed near the entrance to the burrow. Rat traps are also an effective way to catch smaller ground squirrels. The traps should be baited and placed near the burrow entrance. Traps can be placed with an expanded trigger across the squirrel’s travel path. Set this way, the trap does not have to be baited. The animal will step on the trigger as it moves along the path. In rural areas, ground squirrels also can be shot if local laws, ordinances and safety considerations permit. Thirteen-lined ground squirrels are not protected, and therefore can be legally controlled at any time during the year. Franklin’s ground squirrels are an endangered species and cannot be taken without a permit from Indiana Department of Natural Resources Division of Fish and Wildlife. Contact IDNR Division of Fish and Wildlife at (317)232-4200 for permits regarding the control of Franklin’s ground squirrels.